In modern high-tech products, rare metals play an increasingly pivotal role. 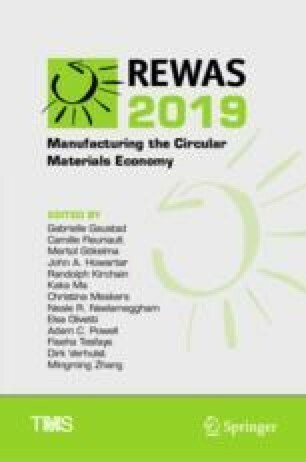 To support the development of a highly sustainable society, where valuable natural resources are not wasted and most materials are recycled, new efficient, environment-friendly recycling technologies for rare metals are required. The authors have developed environment-friendly recycling technologies that efficiently extract rare metals and precious metals from scrap without generating harmful waste solutions (waste liquids) and exhaust gases. These technologies include (1) a technique for converting contaminated titanium scrap, which is expected to increase in the future, into high-quality titanium feed material; (2) a technology for extracting and separating rare metals, such as rhenium, directly from end-of-life turbine blades used in aircraft and power stations without generating any waste aqueous solutions; and (3) a method for efficiently concentrating and separating platinum group metals in automobile catalytic converters without using harmful acids or other chemicals. These technologies will help establish an environment-friendly rare metal recycling system.